On this date in 1820, Louis Pierre Louvel was guillotined at Paris’s Place de Greve for murdering the heir to the French throne. 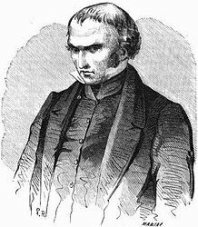 Louvel (French link) was a Bonapartist saddler, so embittered by the return of the ancien regime that he vowed on the day of the Restoration to exterminate all the Bourbons. While his attempt to greet the returning Louis XVIII in April 1814 with a dagger came to naught, Louvel’s patience paid off six years later. 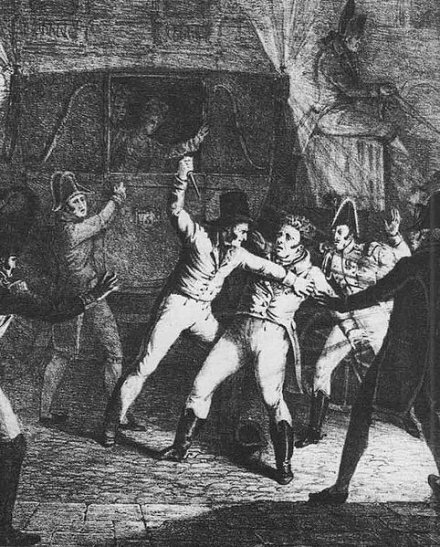 On February 13, 1820, he surprised the Duke of Berry outside the opera and plunged a knife into his chest. The Duke, who expired the next morning, was not the heir to the throne: he was the younger of two sons of the Comte d’Artois, who was the brother of the still-reigning Louis XVIII. These Bourbons, however, seemed congenitally unable to reproduce: Louis XVIII would die childless, leaving the aforesaid Comte d’Artois to inherit as Charles X; the oldest of Artois’s children also had a childless marriage. Because Louvel had his head cut off by the guillotine, he was not around to experience the miraculous September delivery by Louvel’s widow of a posthumous son and heir. In time, this son would become the Legitimist pretender to the French throne. As a matter of fact, the prideful Count of Chambord could have become king after the Franco-Prussian War and the Paris Commune wiped away the Second Empire. But to the grief of practical-minded monarchists, he publicly refused to accept the offered throne that he’d been waiting all his life for unless the nation also gave up the beloved tricolore flag associated with the regicidal Revolution. France said no thanks, and hasn’t had a monarch since. * One more immediate consequence of Louvel’s strike: the liberal monarchist prime minister Elie Decazes came under opportunistic attack by ultra-royalists for giving aid and comfort to the terrorists with his moderate policies. Decazes was forced to resign and briefly went into exile in England due to the Ultras’ fulminations. The refusal of the last male Bourbon was only a pretext. The wife of the prince had an inferiority complex and did not want to become Queen. So the monarchy was not restored because the pretender loved his wife so much, His assassinated father, the Duke de Berry was a friendly guy who had sired several illegitimate children with an American actress. He gave her up when he saw the jolly Italian princess he was going to marry and they were a perfect couple. Somewhere I read that the descendant of the guy who changed his religion for the crown wouldn’t accept the crown unless they changed the flag. An example of how the political skills of the family had deteriorated over the generations.